Panasonic NI-WL600 is a steam iron appreciated for its cordless design. It allows you to work freely without being hindered by the distance you stand from your outlet. Other features such as its double-pointed sole-plate, detachable water tank and automatic shut-off make it all the more appealing. The Panasonic NI-WL600 is a cordless steam iron, so the worry over working around a long cord is eliminated. This feature makes ironing easier and faster to complete. This model heats up quickly despite the fact that it’s cordless. The Panasonic iron reaches the desired temperature in 60 seconds or less, so you can get started immediately. The Panasonic NI-WL600 is one of the more expensive wireless iron models. You can find more powerful corded models or even other cordless models for a lower price. The unit has a small water tank only capable of holding 4 ounces of water. Many other irons can hold double this amount or more. The iron is smaller in size, so it has a smaller sole-plate. This makes it harder to iron larger items. The Panasonic NI-WL600 is one of the few cordless irons on the market. It offers 1,500 watts of power and features a stainless steel sole-plate with two pointed edges. 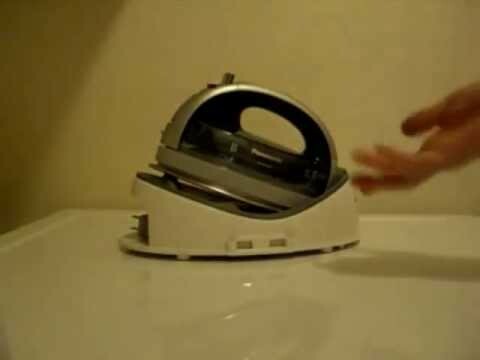 You can move the iron back and forth or rotate it without worrying about making new creases in your clothes. You don’t have to flip the iron around to get into tight spaces around collars or between buttons. This design makes the cordless iron even easier to move around as pressing your garments becomes nearly effortless. The steam ports are located along the edges of the sole-plate, and the unit features 3 temperature settings. Unlike the knob found on many irons with this feature, the Panasonic 360 cordless iron adjusts the temperature with a simple push button on the handle. There are also 3 steam settings including low, high and dry. The main focus of this model is the benefit of doing without a cumbersome cord. It uses a charging base with a 6-foot retractable cord. To use the iron, the charging base is plugged in, and the iron is connected to that. When it is fully charged, an indicator light lets you know when it can be used. The base also acts as a place to rest the iron when it’s not in your hand, and this makes operation much safer. It also keeps the iron charged while you work. The main complaint users seem to have with this model is the fact that it is not hot enough for some fabrics. Due to its wireless nature, this type of iron will have its limits. It may not be able to reach sufficient heat to tackle thick linens, denim or dense cotton. One of its surprising features is its detachable water tank. When the iron needs refilling, you simply take the tank without having to take the entire iron. It also features a 10-minute automatic shut-off even when left on the base. Though it is not without flaws, the Panasonic cordless iron is a convenient device to own. The unit is easy to control and lightweight, and it offers much in the way of ergonomics. If you prefer the ease of not worrying about a tangled cord getting in the way, this may be the best cordless iron for you.